Mikhail Yakushin was born on 20 March 1910 in the Moscow suburbs. Like many Soviet youths at that time, he decided to become a military flier. After graduating from the military pilot training school, he was assigned to the 70th Separate Detachment based in Baku (in the former Soviet Republic of Azerbaijan). There he flew Polikarpov I-I6 fighters with M-22 and M-25 engines. As his colleagues remembered, Yakushin was by nature a restrained man accustomed to expressing his thoughts succinctly and clearly. During the spring of 1937, the second group of Soviet volunteers was sent to Spain. The group was led by Kapitan Ivan Yeremenko and included Leitenant Yakushin ('Carlos Castejón'), Leonid Rybkin, Mikhail Petrov, Sergei Shalyganov and Ivan Karpov. Yakushin had left from Baku. The Russian pilots in this escuadrilla included Evgeni Antonov, Ivan Karpov, Georgii Masterov, Mikhail Petrov, Leonid Rybkin, Anatoly Serov, Nikolai Sobolev, Sergei Shalyganov and Yakushin. The 1a/26 was completed by pilots of different origin; three Spanish, two Austrian, two Americans (one of them was Harold Dahl) and the Yugoslav Bozidar Petrovich. It is also known that Leitenant Leonid Rybkin served as a Patrulla leader and Harold Dahl was part of this Patrulla. Another Patrulla leader was Evgeni Antonov. On 1 July, the 1a Escuadrilla was ordered to conduct reconnaissance flights over all of the enemy highway roads coming to Madrid from the west. In the morning, they started the planned flights; however, no results were gained at first. As the day was tending to the evening, the command decided to conduct the last flight of the day by the whole escuadrilla. Twelve aircraft took off along a road to Avila. Some 30-40 kilometres from the front line, over the region of Toledo, they met and engaged an equal number of CR.32s. In all, the escuadrilla claimed six victories without losses, but none of the Soviet pilots could put a claim for four of the shot-down Fiats because of the confusion of the dogfight. In this combat Kapitan Ivan Yeremenko claimed one CR.32 together with Leitenant Viktor Kuznetsov (some sources credits them with three shared). Leitenant Yakushin claimed a second, which was confirmed by Yeremenko and Kuznetsov. According to some sources this combat took place on 30 June but one source (Shingarev) writes that Commissar of Soviet volunteer pilots, Felipe Agal'tsov, visited them on the afternoon of 30 June (his pseudonym in Spain was Colonel Martin). Shingarev mentions the date of this combat as 1 July 1937, and that it was their first combat over Toledo - they were attacked by a group of Fiat CR.32s. The basic task of the escuadrilla task at this stage of the operations was cover of the capital, for which they were based at Campo Soto airfield. On 6 July, during the battle of Brunete, Starshii Leitenant Anatoly Serov and Leitenant Yakushin of the 1a Escuadrilla claimed a shared Fiat CR.32. Sargento José Redondo Martín, the Spanish pilot of one of the I-15s, was wounded and Leitenant Leonid Rybkin shielded him, but both were forced to fight nine Fiats. One Fiat collided with another and was set on fire; it was in fact credited to Rybkin. Rybkin and Redondo joined with M. Petrov and I. Karpov whom had flown to help. At that moment Leitenant Yakushin, Kapitan Yeremenko, and Starshii Leitenant Anatoly Serov of the 1a Escuadrilla attacked the leading group of Fiats from above. One Fiat was shot down and the pilot bailed out (claimed as a shared between Yakushin, Yeremenko, and Serov). Pilots of I-15s and I-16s had seen four Bf 109s in the area, but they did not attack the Republican fighter. Yakushin claimed a CR.32 on 8 July. The Republican squadrons were effective in defending the airspace above Madrid by day, but the enemy exploited the night to bomb the city. Faced with this situation Starshii Leitenant Anatoly Serov and Leitenant Yakushin of the 1a Escuadrilla, both experienced night pilots in their own country, having obtained authorization from the high command, set about organizing a night fighter group comprising of Viktor Kuznetsov (CO), Serov, Leonid Rybkin, Yakushin and Vladimir Sorokin. The unit was known as the Patrulla de Noche. On the night of 18 July Yakushin intercepted a Ju 52/3m. The Junkers opened fire and slightly damaged the I-15, which, however, landed successfully. The experiment was put into practice on 25 July. Yakushin took off first to patrol at 3000 meters altitude, followed by Serov, at 2600 meters. During the night of 25-26 July, informed that enemy aircraft were bombing the Republican lines in the area around the Escorial, Starshii Leitenant Anatoly Serov and Leitenant Yakushin of the 1a Escuadrilla headed for the front, flying over it by night for the first time. Aided by the glow from the fires, they found the patrol zone. For the success in the night patrol flights flown the last two nights, the Spanish Prime Minister Juan Negrin personally congratulated Yakushin and Starshii Leitenant Serov and presented them each with a gold watch and a personal car as tokens of his gratitude. On 14 August Yakushin claimed a Ju 52/3m. Starshii Leitenant Nikita Syusyukalov of the 1a Escuadrilla claimed a shared Ju 52 with Walter Korouzom over Baharalos on 24 August while Leitenant Yakushin claimed a second. All Russian pilots flying the I-15 were to serve only six months of combat in Spain. It was recognised that many fliers did not endure aerial battles for long, mostly because of the psychological stress of combat, especially after the appearance of the Messerschmitt Bf 109 fighter. Very frequently they fell seriously ill after having been exposed to nervous shock, haemorrhage of the brain, and physical exhaustion from over-work. Many of them couldn't endure the climate, they did not eat, only drinking table water because of the constant heat. Weariness was often reflected on eyes. Yakushin return to Russian from his “official business trip” in October 1937 after having been awarded the Order of the Red Banner and went on to service in the Soviet Air Force. He claimed 6 biplane victories in Spain and his 180 flight hours in Spain included eight night sorties and 25 aerial engagements. Back in the Soviet Union, an acrobatic unit with five I-16s was formed under the command of his friend Anatoly Serov, together with Yakushin and was called 'Red Five'. It is possible that Yakhusin also served as a volunteer in the Sino-Japanese War in 1938. Until June 1938 the Soviet volunteers fought only on the main approaches, defending the large cities of Nankin, Nanchang and Wuhan. During this time, a group of ten I-15bis led by Kapitan Yakushin is reported to have arrived in China. A. Sidorenko was appointed as flight commander to replace him in the acrobatic unit. Yakushin took part in the Soviet-Finnish Winter War of 1939-1940. On 22 June 1941 Yakushin, being a member of the inspection group of the General Staff, arrived by air at one of the airfields of the 11th Mixed Aircraft Division in the region of Stariy Dvor. On hearing of the attack on the USSR by German troops, Yakushin ordered to the Regiment Commander to shift a half of his aircraft to a reserve air field in the region of Lidda. His school-mate from flight school, 9th Mixed Aircraft Division Commander Brigade-General Sergey Chernikh (also a participant of the war in Spain) had little time - almost all of his aircraft were annihilated on the ground (Hero of the Soviet Union S. Chernikh was executed on 27 July together with a group of other commanders blamed for the failures in the early period of the war). Even then, when many of Soviet aircraft had already been burnt on the airfields, some commanders still did nothing because of the threat of severe penalties for any provocations against the Germans. Any display of personal initiative by a commander or voluntarily-made orders were forbidden under threat of tribunal These prohibitions also applied to Yakushin, who notwithstanding orders, risked his own life attempting to save aircraft. In July 1941, Major Yakushin was appointed as a superior of one of the AF sectors of Moscow and later he became Deputy Commander of the 6 IAP. 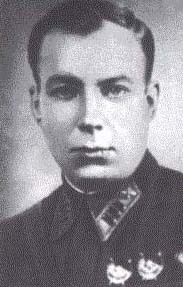 Polkovnik Yakushin commanded the 215 IAD during the battle of Kursk in July 1943. At the time, the 215 IAD consisted of 156 IAP (La-5), 263 IAP and 813 IAP. He finished the war as commander of the 215 IAD. Included in this division was the 8 IAP under the command of another veteran from Spain, Aleksandr Osipenko. The 215 IAD operated over East Prussia during 1944. After the war, he served in several command posts. Mikhail Yakushin retired from Air Force with the rank of General Major. During his career, he was decorated with Order of Lenin, the Order of the Red Banner (four times), the Order of Alexandr Nevskii, the Order of Patriotic War and the Order of the Red Star (twice). He passed away in Moscow on 5 July 1999. Biplane victories: 6 and 2 shared destroyed. (a) Some sources states that the date was 30 June 1937. (b) Republican fighters claim at least 2 CR.32 during the day in the Brunete area. Only 1 CR.32 was lost during the day, when Sottotenente Vercellio from the 19a Squadriglia was KIA on the afternoon. (d) Ju 52/3m “22+76” from 3.K/88. Leutnant Leo Falk, Feldwebel George Übelhack, Unteroffizier Fritz Berndt, Unteroffizier and Walter Brötzmann were killed. Unteroffizier August Heyer was captured. Additional information kindly provided by Vladislav Arhipov and Carlos Casas.